The International Civil Aviation Organization (ICAO), the UN agency charged with setting standards for international flights, has set a goal of “carbon neutral growth from 2020” – i.e. capping net emissions at year-2020 levels. The ICAO Assembly today adopted a global market-based measure that lets airlines purchase high-quality emission reductions to offset the carbon growth above the cap. Analysis of high-quality data on aviation emissions projections demonstrates the ICAO market-based measure is a critical step forward for climate action, and could prevent nearly 2.5 billion tonnes of CO2 emissions into the atmosphere over the first 15 years of the program. Here’s how. least developed countries, land-locked developing countries, and small island developing countries would all be exempt throughout (although these states could opt in at any time if they so choose). What this means for ICAO’s commitment to “carbon neutral growth from 2020” depends on how many more countries decide voluntarily to opt in. EDF has developed an interactive tool to allow users to estimate how many emissions would be covered of the billion-tonne gap between projected emissions and the 2020 cap, if various countries opt in to the MBM. The tool provides unique calculations of the aviation sector’s emissions growth based on projections from ICAO, industry and analysts. The focus on emissions provides a direct estimate of the aviation sector’s contribution to climate change that complements analyses based on aviation’s traffic growth, measured in revenue tonne kilometers (RTKs). Here’s the snapshot of the tool as of the adoption of the market-based measure on October 6. 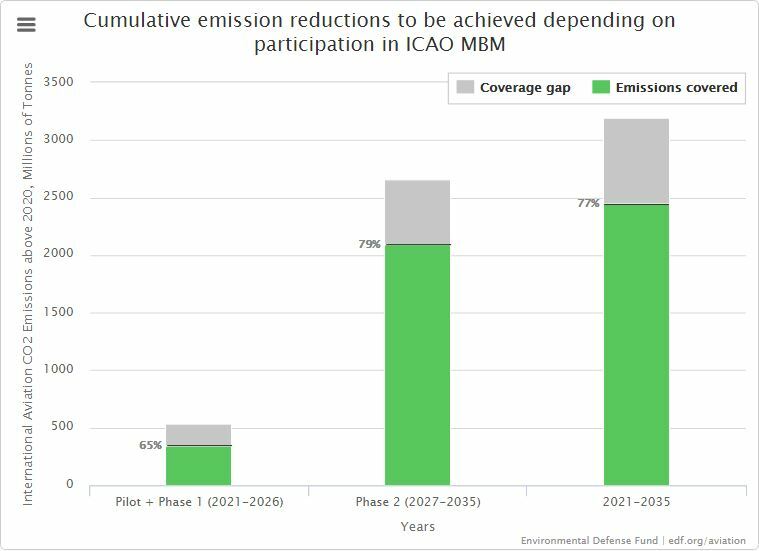 With Qatar and Burkina Faso becoming the 64th and 65th countries to signal their intent to participate in the MBM from the start, 65% of emissions growth above 2020 would be covered in Pilot + Phase 1, and nearly 80% (79%) of these emissions would be covered during Phase 2 of the program (2027-2035). Importantly, 77% of anticipated emissions growth above 2020 would be covered over the first fifteen years of the program. The tool shows the importance of commitments to early participation by the Asia-Pacific aviation powerhouse states of Singapore, Japan, Korea, and Australia; the Middle Eastern aviation dynamos of United Arab Emirates and Qatar; Latin American states like Mexico, Costa Rica, Guatemala; and leading African states such as Kenya. It also shows that as exempted states increase in their importance as aviation powers, participation by at least some of them will be significant for boosting overall coverage toward the goal of carbon-neutral growth from 2020. Consequently, it will be important for today’s leading aviation countries to help build MBM capacity in the anticipated aviation leaders of tomorrow. A number of countries that are exempt under the resolution’s formulas, including leading voices from the front lines of climate impacts – Burkina Faso, Marshall Islands, Papua New Guinea, Costa Rica, Guatemala, and Kenya – have announced their intent to participate, and more are expected to join. After nearly two decades of effort, ICAO is providing global leadership, with both developed and developing countries taking the lead. Hand in hand with this week’s announcement about ratification of the Paris Agreement, that’s good news indeed. Can airlines help reduce deforestation? Will Washington meeting on aviation pollution be undermined by U.S. airlines?